Cover artwork: Simeon, from a fifteenth-century Book of Hours. 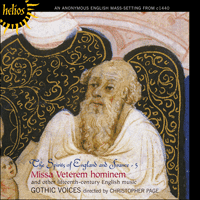 This latest release from Gothic Voices forms a pair with the Missa Caput (CDH55284). Missa Veterem hominem is an anonymous English Mass from circa 1440. It is a work of intricate detail and great significance as one of the earliest examples of a composition for what we would regard today as a 'standard' four-part choir. It is performed here with captivating vigour and commitment. Also included are hymns from the Sarum chant books. The presentation of these monophonic songs makes this disc an invaluable resource for anyone interested in the tunes (Christe, qui lux es, Jesu salvator, and Salvator mundi, for example) which lie beneath so many later polyphonic works by Tallis and numerous others. But if that isn't enough, they are also sung with extreme conviction and an austere yet remarkable beauty. Missa Veterem hominem can justly be regarded as the ‘sister’ Mass to the Missa Caput which was recorded on Volume 4 of The Spirits of England and France. Volume 5 is a further development to the repertoire of Gothic Voices in the exploration of polyphonic English Masses of the fifteenth century and also includes some of the most outstanding lyrics from the wealth of Sarum chant. Like the Missa Caput, the Missa Veterem hominem was part of a flood of English music which engulfed Continental Europe in the early to mid-fifteenth century. Both Masses turn up in the so-called ‘Trent Codices’, a series of seven manuscripts which, with some eighteen hundred pieces, is by far the largest repository of music to have survived from the first three-quarters of the century. As testimony to the remarkable breadth of interest in English music, Veterem hominem even travelled as far as eastern Silesia, or Bohemia, where it was copied into the so-called ‘Strahov’ manuscript; and if the quotation from the Mass in Morley’s Plaine and Easie Introduction to Practicall Musicke of 1597 is anything to go by its breadth of transmission was matched by its longevity, as a didactic curiosity if nothing else. Sadly this late fragment is the only source for the Mass to have survived on its native soil: the insular copies which must once have existed clearly fell prey to the changes of fashion which, as for most English music of the period, in time rendered them obsolete for performance purposes. But for a tiny handful of manuscripts, the glorious richness which was clearly English music in the early fifteenth century is represented in England now only by pitiful fragments drawn from sixteenth-century bookbindings. Missa Veterem hominem is fact shares a great deal more with the ‘Caput’ Mass than just English origin: indeed, so similar in construction are the pieces that they can even be called ‘sister’ Masses. Both were presumably composed around the late 1440s, and both were part of the first maturity of the cantus firmus Mass, the procedure devised in England and enthusiastically emulated on the Continent, in which each movement is built on the same borrowed melody. Both are also written for four voices with a low contratenor, a texture rare at the time but which was soon widely adopted on the Continent, and both present the cantus firmus twice in each movement in so-called ‘double cursus’ format, once each in triple and duple metre. In fact the structure and layout of Caput and Veterem hominem became the blueprint for a spate of four-voice Continental Masses in the 1450s, some of which clone their models so comprehensively that it is difficult or even impossible to determine whether their composers were English or Continental. Even the borrowed melodies of the two Masses have features in common: both derive from antiphons and both are in mode 7 on G. As in many early English Masses, the melodies are deployed in identical rhythmic successions in each movement, though differences in the lengths of rests and duos mean that some movements are longer than others. One of the longest movements in both cases is the Kyrie, for which both Masses set the long troped Kyrie text ‘Deus creator omnium’ as prescribed for performance on all principal and major double feasts in the Sarum and other English rites. Across the rigid armature imposed by the cantus firmus the anonymous composers lay glittering musical lines with now one voice, now another emerging above the surface of the texture and carrying forwards a succession of rhythms and sonorities. As John Caldwell has remarked, the plainsong of Veterem hominem is clothed in ‘a bold and resourceful web of melody in the three accompanying voices, closely knit without any sacrifice of clarity’ (The Oxford History of English Music, i, The Beginnings to c1715 (Oxford, 1991), p 155). Like the Missa Caput the sheer confidence displayed by the master who wrote the Missa Veterem hominem forbids the kind of tranquil performance which fifteenth-century English music is often given today. Such a style seems to work well for some of the shorter, contemplative Marian antiphons such as Sancta Maria virgo or Mater ora filium and is almost universally used now for the music of Dunstable, but in many places the Veterem hominem master creates a contratenor line (the second voice down in the modern score) with animated and syncopated passages which recall motets of the previous century such as Degentis vita (recorded on The Medieval Romantics) and it seems essential for such music to be presented with velocity and drive. As we rehearsed Veterem hominem and the Missa Caput we became increasingly convinced that we wished to render the music as a festive clamour, fast and loud, capturing what might have been done by four soloists, proud of their artful contribution to a major liturgical feast and, during the plainchant passages, itching to get up and make it. As with the Missa Caput we decided against a liturgical reconstruction, but to preserve the alternation of polyphony and plainsong—surely essential to a balanced experience of the polyphonic movements—we have interposed some of the most beautiful and contemplative hymns of the Use of Sarum by way of contrast. The first thirteen tracks of this recording are therefore planned as a whole. Beginning with a characteristically taut setting from the repertoire of fifteenth-century English carols, Jesu, fili virginis, the programme continues with three monophonic pieces to accustom the listener to monody. This, it is to be hoped, will restore to the Veterem hominem polyphony some of the opulence it would have represented to its original audience. The antiphon Doleo super te, David’s lament for Jonathan, reminds us just how many fine plainchant lyrics there are in the Sarum books, lyrics which should be viewed as so much more than historical curiosities (the chants on which later and better known polyphonic works are based) and which deserve to be performed and judged as free-standing songs of great beauty. Doleo super te was much admired, and is praised by one medieval theorist for its expressive and low-lying melody. The responsory Gaude Maria virgo figures in a large number of medieval miracle stories, many of which were circulating in England during the lifetime of the Veterem hominem master (as we know from Cambridge, Sidney Sussex MS95. See Christopher Page, ‘Marian Themes and Images in a Fifteenth-Century English Manuscript: A Miscellany in Two Parts’, Plainsong and Medieval Music, 5 (1996), pp 23–44). It was especially admired for its high tessitura, and one miracle story relates how it was often sung by a young man with a fine voice to ‘the canons of a certain cathedral church in Italy’ as a virtuoso solo song. We follow this with a Sarum plainsong setting of the Kyrie trope Deus creator omnium, the words of which are again employed in the Kyrie of the Missa Veterem hominem. This long troped text or ‘prosula’, also used as the Kyrie of the Missa Caput, represents the strongest proof that these masterworks are of English, rather than Continental, origin. The performance recorded here is based upon the edition of Missa Veterem hominem by Margaret Bent, Fifteenth-Century Liturgical Music, 11, Four Anonymous Masses, Early English Church Music, 22 (London, 1979). I am grateful to Dr Bent for discussing some points with me. The recording departs from the edition only in these respects: all the voices are texted throughout; and there are occasional changes to the editorial ficta, none of them principled save that they reflect what the musicians involved in the recording found most gracious to voice and ear. La Missa Veterem hominem peut être, à juste titre, considérée comme la messe «sœur» de la Missa Caput, enregistrée sur le précédent volume de cette même série. Le présent volume, le cinquième, marque une progression du répertoire des Gothic Voices dans l’exploration des messes polyphoniques anglaises du XVe siècle, et inclut également quelques-uns des plus remarquables chants du riche rite de Sarum. Comme la Missa Caput, la Missa Veterem hominem fit partie d’un des flots de musique anglaise qui engloutirent l’Europe continentale pendant la première moitié du XVe siècle. Ces deux messes figurent dans les «Codex de Trente», une série de sept manuscrits, dont les quelque mille huit cents pièces constituent de loin le plus grand recueil de musique à avoir survécu depuis les trois premiers quarts du XVe siècle. Preuve du remarquable intérêt pour la musique anglaise, la Veterem hominem voyagea jusqu’en Silésie orientale, ou Bohême, où elle fut copiée dans le manuscrit «Strahov»; et le fait qu’elle soit en partie citée dans la Plaine and Easie Introduction to Practicall Musicke de Morley (1597) atteste que sa longévité égala l’ampleur de sa transmission, au moins comme curiosité didactique. Malheureusement, seul ce dernier fragment permit à la messe de survivre sur son sol natal: les copies insulaires qui durent exister jadis furent, de toute évidence, la proie des changements de mode et finirent par devenir obsolètes, à l’instar de l’essentiel de la musique anglaise de l’époque. Excepté une minuscule poignée de manuscrits, la glorieuse richesse qu’était manifestement la musique anglaise au début du XVe siècle n’est plus représentée en Angleterre que par de pitoyables fragments issus de livres reliés du XVIe siècle. Les similitudes entre la Missa Veterem hominem et la messe «Caput» vont bien au-delà de leur seule origine anglaise. En fait, ces deux pièces sont de construction si identique qu’elles peuvent être qualifiées de messes «sœurs». Probablement composées vers la fin des années 1440, toutes deux firent partie de la première maturité de la messe sur cantus firmus, procédé conçu en Angleterre, mais imité avec enthousiasme en Europe continentale, dans lequel chaque mouvement est construit sur la même mélodie empruntée. Toutes deux sont, aussi, écrites pour quatre voix, avec un contratenor grave (une texture rare à l’époque, mais bientôt largement adoptée en Europe continentale), et présentent le cantus firmus deux fois par mouvement, dans un format de «double cursus»—une fois dans une mesure ternaire, une fois dans une mesure binaire. En fait, la structure et l’agencement de ces deux messes devinrent le prototype de toute une série de messes à quatre voix dans l’Europe continentale des années 1450; certaines sont de si parfaites imitations qu’il est difficile, voire impossible, de déterminer si leurs compositeurs étaient d’Angleterre ou d’Europe continentale. Même les mélodies empruntées de la Veterem hominem et de la Caput possèdent des caractéristiques communes, chacune dérivant d’antiennes et étant en mode 7, sur sol. Comme dans nombre de messes anglaises anciennes, ces mélodies se déploient dans des successions rythmiques identiques dans chaque mouvement, bien que des différences dans les durées des pauses et des duos impliquent que certains mouvements sont plus longs que d’autres. Dans les deux cas, l’un des mouvements les plus longs est le Kyrie, pour lequel les messes mettent en musique le long texte tropé «Deus creator omnium», conformément aux prescriptions d’interprétation pour les fêtes doubles de première classe et les fêtes doubles majeures, dans les rites de Sarum et les autres rites anglais. Sur l’armature rigide imposée par le cantus firmus, les compositeurs anonymes ont disposé des lignes musicales étincelantes, avec tantôt une voix, tantôt une autre émergeant au-dessus de la surface de la texture et véhiculant une succession de rythmes et de sonorités. Comme le remarqua John Caldwell, le plain-chant de la Veterem hominem est drapé dans «un tissu mélodique hardi et ingénieux dans les trois voix d’accompagnement, tricoté de façon serré, sans aucun sacrifice de clarté». A l’instar de la Missa Caput, la Missa Veterem hominem bénéficia d’une écriture à l’assurance aiguë, qui exclut le type d’interprétation tranquille actuellement appliqué à la musique anglaise du XVe siècle. Un tel style semble par contre tout à fait convenir à certaines des antiennes mariales plus brèves et contemplatives—ainsi Sancta Maria virgo ou Mater ora filium—, et est désormais presque toujours utilisé pour la musique de Dunstable; mais, le maître de la Veterem hominem crée, en maints endroits, une ligne de contratenor (la deuxième voix des partitions modernes), avec des passages animés et syncopés, qui rappellent les motets du siècle précédent, tels Degentis vita (enregistré sur le disque The Medieval Romantics), et il semble essentiel que pareille musique soit présentée avec vélocité et dynamisme. Au cours de nos répétitions de la Veterem hominem et de la Missa Caput, nous fûmes de plus en plus convaincus que notre désir était de rendre la musique comme une clameur festive, rapide et puissante, capturant ce qui aurait pu être accompli par quatre solistes fiers de leur contribution experte à une fête liturgique majeure, et démangés, pendant les passages de plain-chant, par l’envie de se lever et de le faire. Comme pour la Missa Caput, nous nous sommes prononcés contre une reconstruction liturgique mais avons intercalé, par souci de contraste, certaines des plus magnifiques et des plus contemplatives hymnes du Sarum Use, à même de préserver l’alternance de polyphonie et de plain-chant—assurément cruciale pour l’équilibre des mouvements polyphoniques. Les treize premières pistes du présent enregistrement sont, par conséquent, conçues comme un tout. Le programme débute avec Jesu, fili virginis, une mise en musique, à la tension caractéristique, extraite du répertoire des carols anglais du XVe siècle, puis se poursuit avec trois pièces monophoniques, pour accoutumer l’auditeur à la monodie. Ainsi espérons-nous rendre à la polyphonie de la Veterem hominem un peu de l’opulence offerte à son auditoire originel. L’antienne Doleo super te, la lamentation de David sur Jonathan, ne fait que nous rappeler combien les livres de Sarum renferment de beaux plains-chants, des chants qui devraient être considérés comme bien plus que de simples curiosités historiques (sur lesquelles se fondent les œuvres polyphoniques ultérieures, mieux connues), des chants qui méritent d’être interprétés et jugés comme des œuvres indépendantes, d’une grande splendeur. Doleo super te fut énormément admiré, et un théoricien médiéval loue sa mélodie grave, expressive. Le répons Gaude Maria virgo figure dans un grand nombre de miracles médiévaux, dont beaucoup circulaient en Angleterre, du vivant du maître de la Veterem hominem. Cette pièce fut particulièrement appréciée pour sa tessiture élevée, et un miracle relate qu’un jeune homme à la belle voix l’interprétait souvent, conformément aux «canons d’une certaine église cathédrale d’Italie», comme un chant soliste virtuose. Nous le faisons suivre d’une mise en musique, selon le plain-chant de Sarum, du trope de Kyrie Deus creator omnium, dont les paroles sont reprises dans le Kyrie de la Missa Veterem hominem. Ce long texte tropé, ou «prosula»—également utilisé comme Kyrie de la Missa Caput—, apporte la preuve la plus convaincante de l’origine anglaise, et non continentale, de ces chefs-d’œuvre. La présente interprétation repose sur l’édition de la Missa Veterem hominem établie par Margaret Bent, Fifteenth-Century Liturgical Music, 11, Four Anonymous Masses, in Early Church Music, no 22 (Londres, 1979). Je suis reconnaissant au Dr Bent d’avoir discuté certains points avec moi. L’enregistrement ne se départit de son édition qu’aux égards suivants: toutes les voix comportent un texte de bout en bout, et certains changements occasionnels affectent les ficta éditoriales, qui ne font que refléter ce que les musiciens impliqués dans le présent enregistrement trouvèrent de plus gracieux, tant pour la voix que pour l’oreille. Missa Veterem hominem kann zu Recht als die „Schwester“ der Missa Caput bezeichnet werden, die in der vorherigen Ausgabe von The Spirits of England and France zu hören war. Im Zusammenhang mit der Erforschung der polyphonen englischen Messen des 15. Jahrhunderts ist Band 5 ein weiterer Beitrag zum Repertoire der gotischen Stimmen und umfaßt einige der außerordentlichsten Texte aus dem Schatz der Gesänge von Salisbury. Ebenso wie die Missa Caput war auch die Missa Veterem hominem ein Teil der Flut an englischer Musik, die das kontinentale Europa in der ersten Hälfte des 15. Jahrhunderts überschwemmte. Beide Messen tauchen in den sogenannten „Trienter Kodexen“ auf, einer Gruppe von sieben Manuskripten, die mit etwa achtzehntausend Stücken das bei weitem größte erhalten gebliebene Musikrepertoire aus den ersten 75 Jahren des Jahrhunderts darstellen. Daß das Veterem hominem sogar bis nach Ostschlesien und Böhmen gelangte, wo es als das sogenannte „Strahov“-Manuskript kopiert wurde, bezeugt das seinerzeit erstaunlich weitreichende Interesse an englischer Musik. Wenn man dem Zitat aus der Messe in Morleys Plaine and Easie Introduction to Practicall Musicke („Klare und einfache Einführung in die praktische Musik“) aus dem Jahre 1597 glauben darf, so entspricht ihr Verbreitungsradius ihrer Langlebigkeit, wenn auch nur als didaktische Kuriosität. Bedauerlicherweise ist dieses letzte Fragment der einzige Anhaltspunkt für diese Messe, der die Zeiten in seinem Ursprungsland überdauerte: Die englischen Kopien, die einst existiert haben müssen, fielen ganz eindeutig den Mode- und Stilveränderungen zum Opfer. Wie der Großteil der damaligen englischen Musik wurden sie allmählich als überholt und für Aufführungszwecke ungeeignet erklärt. Abgesehen von einer kleinen Handvoll Manuskripte, spiegelt sich der Glanz und Reichtum der englischen Musik des frühen 15. Jahrhunderts im heutigen England nur noch in ein paar armseligen Fragmenten aus erhalten gebliebenen Buchbeständen des 16. Jahrhunderts wider. Die Missa Veterem hominem hat jedoch noch wesentlich mehr mit der „Caput“-Messe gemeinsam als nur ihren englischen Ursprung: Diese beiden Werke ähneln sich so stark in ihrem Aufbau, daß man sie regelrecht als „Geschwister“ bezeichnen kann. Beide wurden vermutlich zwischen 1445 und 1450 geschrieben und waren Bestandteil der ersten ausgereiften Form der Cantus firmus-Messe, einer Form, die in England entwickelt und mit Begeisterung auf dem Kontinent kopiert wurde, und in der alle Sätze auf der gleichen geliehenen Melodie aufgebaut sind. Zudem sind beide Stücke für vier Stimmen mit einem tiefen Contratenor geschrieben – eine zu jener Zeit selten gebrauchte Struktur, die jedoch bald großen Anklang auf dem Kontinent fand. Beide Messen präsentieren den Cantus firmus zweimal pro Satz im sogenannten „doppelten Cursus“, jeweils einmal im Zweier- beziehungsweise Dreiertakt. In der Tat dienten die Struktur und der Aufbau von Caput und Veterem hominem in den 1450er Jahren als Modell für eine Flut von vierstimmigen kontinentalen Messen. Einige dieser Messen sind so exakte Kopien ihrer Vorlagen, daß es schwierig, ja fast unmöglich ist, die Herkunft ihrer Komponisten zu bestimmen, d. h. festzustellen, ob sie englischen oder kontinental-europäischen Ursprungs sind. Selbst die entlehnten Melodien der beiden Messen weisen Gemeinsamkeiten auf: Beide stammen von Antiphonen und stehen im 7. Modus auf G. Wie bei vielen frühen englischen Messen werden die Melodien auch hier in jedem Satz in identischen rhythmischen Aufeinanderfolgen dargelegt, wobei die Unterschiede in der Pausen- und Duolänge auf unterschiedliche Satzdauer hinweisen. In beiden Fällen ist das Kyrie einer der längsten Sätze, für den in beiden Messen der lange tropierte Kyrietext „Deus creator omnium“ verwendet wird, so wie es für Vorträge bei allen wichtigen und bedeutenden Doppelfesten im Ritus von Salisbury und anderen englischen Riten vorgeschrieben ist. Über die strenge, vom Cantus firmus diktierte Vorzeichnung legt der unbekannte Komponist glänzende musikalische Linien; anfangs nur mit einer Stimme, doch dann taucht eine zweite an der Strukturoberfläche auf und trägt eine Folge von Rhythmen und Klängen vor. Wie John Caldwell bemerkte, ist der Choral von Veterem hominem in „ein gewagtes und phantasievolles melodisches Gewand der drei Begleitstimmen gekleidet, das zwar sehr fein gewebt ist, jedoch nichts von seiner Transparenz einbüßt“. Das starke Selbstvertrauen, das der meisterhafte Komponist von Missa Veterem hominem an den Tag legt (und das auch in der Missa Caput spürbar ist), untersagt jene ruhiggelassene Vortragsweise, die heutzutage häufig auf englische Musik aus dem 15. Jahrhundert angewandt wird. Ein solcher Stil scheint für einige kürzere, beschaulichere Antiphone wie Sancta Maria virgo oder Mater ora filium passender und wird heutzutage fast überall für die Musik von Dunstable verwendet. An vielen Stellen entwickelt der Komponist von Veterem hominem jedoch eine Contratenor-Linie (die zweittiefste Stimme der modernen Partitur) mit belebten und synkopierten Passagen, die an Motetten aus dem vorhergehenden Jahrhundert, wie zum Beispiel Degentis vita, erinnern (das auf der Die Romantiker des Mittelalters zu hören ist). Solche Musik erfordert unbedingt eine schnelle und schwungvolle Vortragsweise. Während unserer Proben von Veterem hominem und der Missa Caput wurde der Wunsch in uns immer stärker, die Musik in einen festlichen Klamauk umzuwandeln, schnell und laut, und jene Aufgaben auf uns zu vereinen, die eigentlich von vier Solisten hätten getragen werden können—vier Solisten, die stolz auf ihren künstlerischen Beitrag zu einem bedeutenden liturgischen Fest sind und während der Choralpassagen darauf brennen, aufzuspringen und eben diesen Beitrag zu leisten. Wie bei der Missa Caput entschieden wir uns auch in diesem Falle gegen eine liturgische Rekonstruktion, doch um den Wechsel von Polyphonie und Choral zu wahren—der zweifelsohne unbedingt notwendig für die Ausgewogenheit der polyphonen Sätze ist—, haben wir einige der schönsten und beschaulichsten Hymnen aus dem Salisbury-Repertoire als Kontraste eingefügt. Die ersten dreizehn Nummern dieser Aufnahme sind daher als ein zusammengehöriges Ganzes gedacht. Das Programm wird mit einer Vertonung von typischer Knappheit aus dem Repertoire englischer Weihnachtslieder des 15. Jahrhunderts, nämlich Jesu, fili virginis, fortgesetzt, gefolgt von drei monophonen Stücken, um den Zuhörer auf Monodie einzustimmen. Dies wird der Veterem hominem-Polyphonie, so wollen wir hoffen, etwas von dem Reichtum und der Fülle zurückgeben, in deren Genuß ihr ursprüngliches, zeitgenössisches Publikum gekommen wäre. Die Antiphon Doleo super te, Davids Klagelied für Jonathan, erinnert uns wieder daran, wie viele hervorragende Choraltexte die Salisbury-Bücher in sich bergen—Texte, die als viel mehr als nur historische Kuriositäten (die Choräle, auf die sich spätere und bekanntere polyphone Werke aufbauen) gewertet werden sollten, und die es zudem verdienen, als unabhängige Lieder von großer Schönheit gewürdigt und aufgeführt zu werden. Doleo super te wurde einst große Bewunderung zuteil, und von Theoretikern des Mittelalters wird sie aufgrund ihrer expressiven und einfachen Melodie gepriesen. Das Responsorium Gaude Maria virgo findet in zahlreichen mittelalterlichen Wundergeschichten Erwähnung, von denen viele zu den Lebzeiten des Veterem hominem-Komponisten in England erzählt wurden. Das Responsorium wurde besonders wegen der hohen Lage seiner Vokalstimme bewundert, und eine der Wundergeschichten erzählt, daß es oft von einem jungen Mann mit einer herrlichen Stimme zu den „Kanons einer gewissen Kathedrale in Italien“ als virtuoses Sololied gesungen wurde. Es schließt sich nun eine Salisbury-Choralvertonung des Kyrie-Tropus Deus creator omnium an, dessen Worte erneut im Kyrie von Missa Veterem hominem verwendet werden. Dieser lange tropierte Text oder „Prosa“, der auch als das Kyrie von Missa Caput eingesetzt wird, stellt den durchschlagendsten Beweis dafür dar, daß diese Meisterwerke englischer, und nicht kontinental-europäischer Herkunft sind. Die hier aufgenommene Aufführung stützt sich auf die Missa Veterem hominem-Edition von Margaret Bent, aus Fifteenth-Century Liturgical Music, 11, Four Anonymous Masses („Liturgische Musik des 15. Jahrhunderts, 11, Vier unbekannte Messen“), Frühe englische Kirchenmusik, 22 (London, 1979). Ich möchte Dr. Bent meinen Dank für die Erörterung einiger Aspekte aussprechen. Die Aufnahme weicht nur in folgender Hinsicht von der Edition ab: Alle Stimmen sind durchgehend mit Text belegt, und es wurden gelegentliche Veränderungen der Editionen vorgenommen, von denen keine grundsätzlich ist, außer daß sie ein Spiegelbild dessen sind, was nach Ansicht der an dieser Aufnahme beteiligten Musiker der Stimme und dem Ohr am meisten schmeichelt.